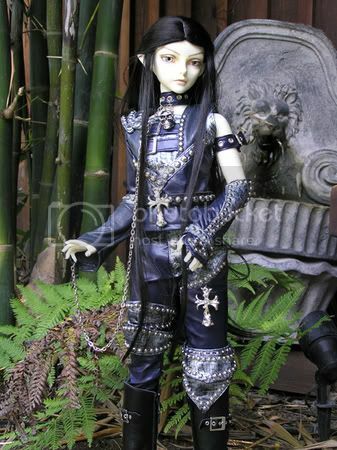 Elurin is a Cerberus Project (company/maker) Delf (SD-sized) Elf El (model/type) Limited #68 of 68, BW (White Skin tone). 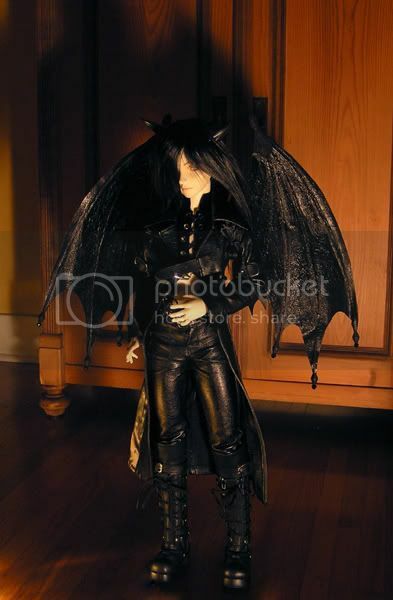 He came with an additional Elf El Vampire (Dreaming--half-closed eyes) head. 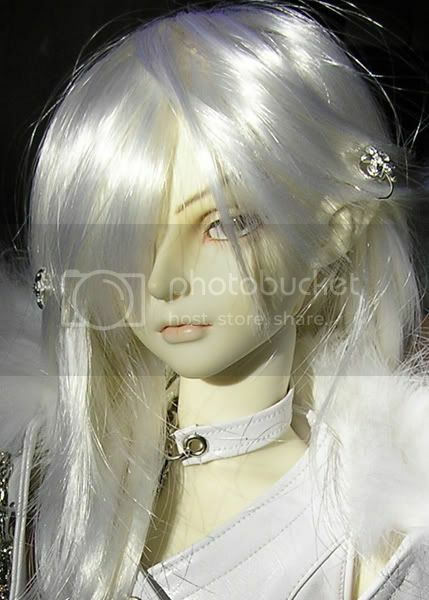 And 18mm glass eyes and a white wig. 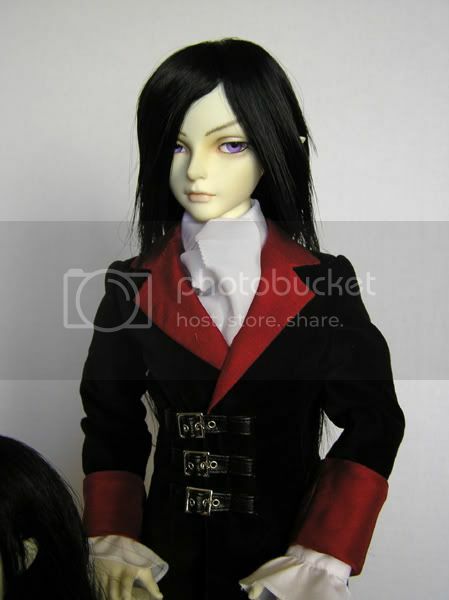 I ordered him through Liria, a Cerberus Project representative. 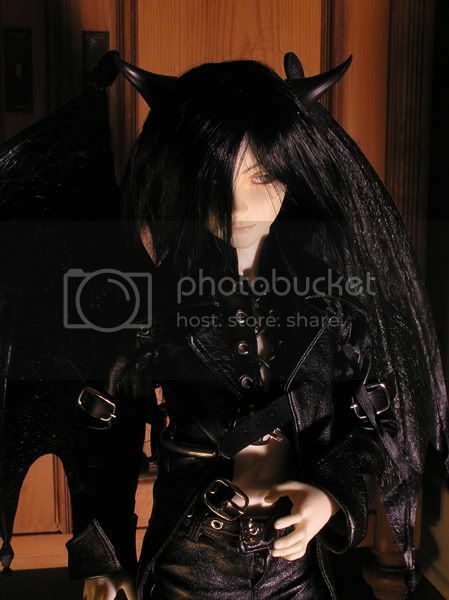 He has a CP default faceup that has been slightly modified by me. I darkened the eyebrows and took off his eye-gloss. I named him Elurin, which is a Sindarin elf name from J.R.R. Tolkien's books--because he is an elf, because I love Tolkien's books, and because it has the sound of "El" which is the sculpt name. Elurin in Tolkien had a twin brother, Elured. 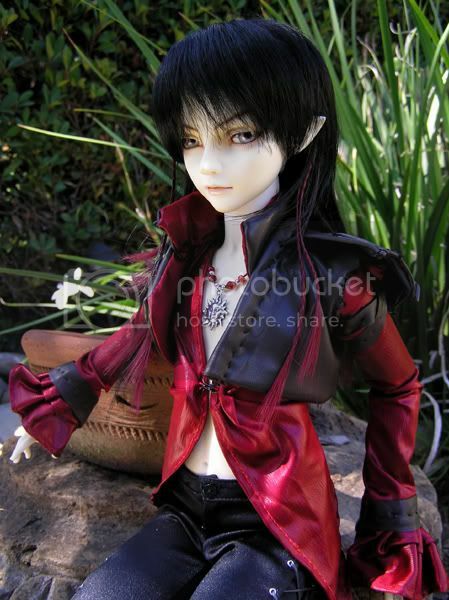 I may name the Elf Elf Vampire that name... or a variant: Elureth. 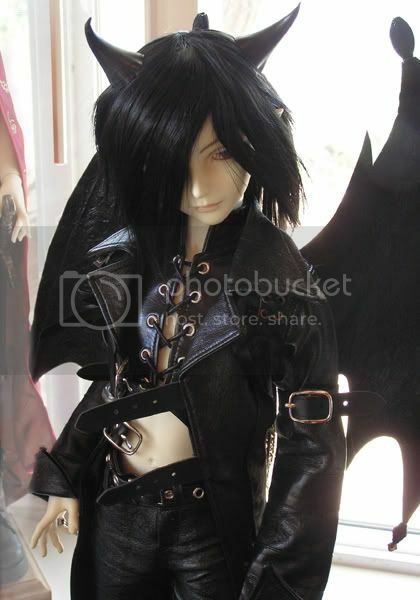 Elurin is my first BJD and I must admit he is a favorite of mine. He is a mysterious fellow, very intelligent, not talkative, but not shy, tends to be a loner, but can socialize well if he is in the mood, enjoys a bit of the dramatic, but likes honesty and fairness and creativity. He does not have a default look--although he prefers light-colored eyes--pale silver-gray or pale violet, and black hair, but will also wear many other colors and styles. 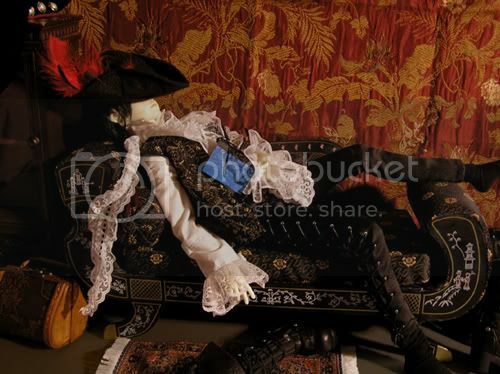 He likes to wear black and is a bit of a romantic, historical goth. Loves dressing well and dramatically. He won't mind looking totally different from one day to the next. Early Photoshoot--basic elf-like look. Wearing a CanCan wig. Same photoshoot, more of a glamor-shot. 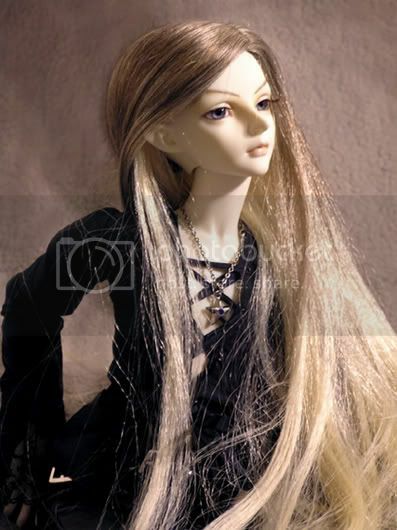 Wearing SoulDoll Bronze Snake outfit. 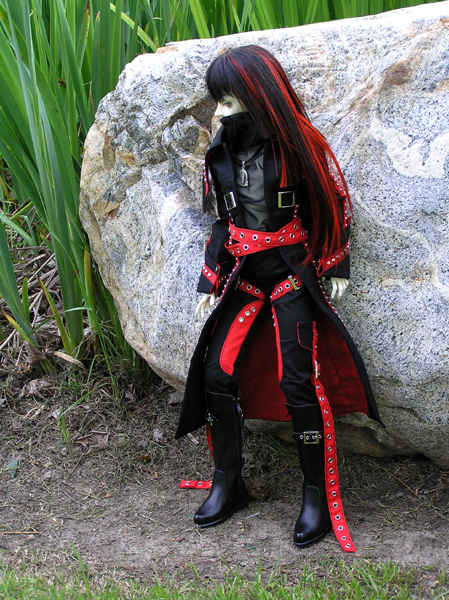 At the L.A. Easter Meetup '05 at the Huntington, wearing SoulDoll Red Pirate outfit. 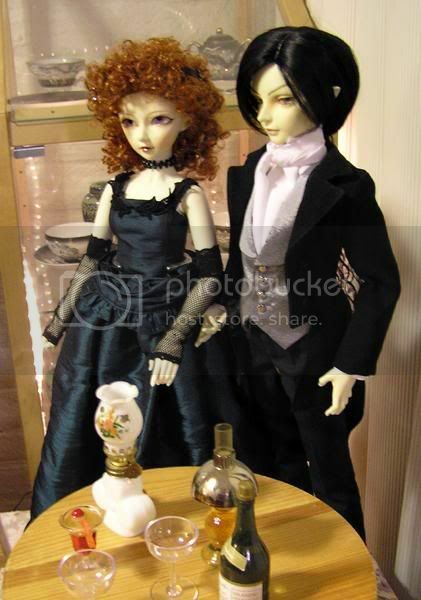 At Pam SD's Valentine Day's Meet '06, wearing DollHeart Romance of London, Souldoll eyes, Ajumapama wig. 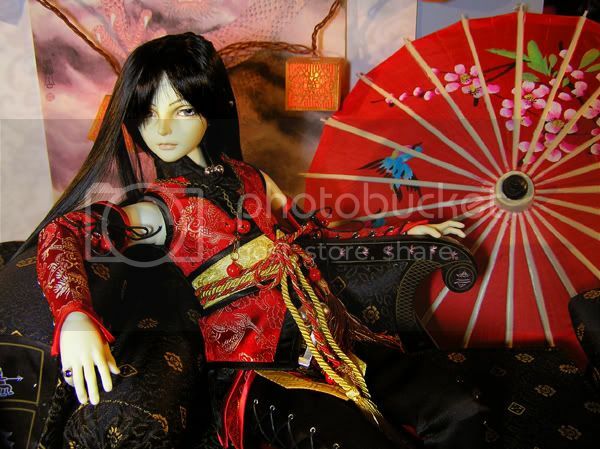 At the Huntington Tea Meetup '06, wearing traditional kimono and hakama by miniorient on ebay. In the Garden wearing shirt and vest by Milka of DoA. Christmas 2006, Downtown Disney meetup. 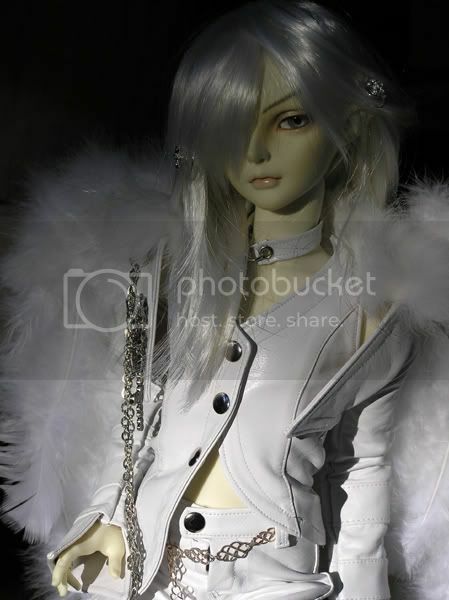 In Heisejinyao White Angel outfit, Luts wig, Silver Mystic/Eyecandy s17 16mm eyes. In Heisejinyao outfit, Dollheart Romance of London outfit trousers, orangebabydolly ring, Luts wig, Silver Mystic/Eyecandy s17 16mm eyes. In Heisejinyao pieces from Dark Devil and Lost Angel, orangebabydolly ring, Ajumapama wig, Forest of Avalon-LadyMorghayne batwings from ebay, plastic Halloween clip-on horns, Silver Mystic/Eyecandy s17 16mm eyes. At Pam SD's Halloween Party, '06. In Heisejinyao pieces from Dark Devil and Lost Angel, orangebabydolly ring, Ajumapama wig, Forest of Avalon-LadyMorghayne batwings from ebay, plastic Halloween clip-on horns, Silver Mystic/Eyecandy s17 16mm eyes. Elurin won a prize (Ghiradelli Chocolates) at the Elfdoll Halloween Party--for "Scariest" Costume--I think. At New Year's Day Party (Bruce & Lise's), 2008. 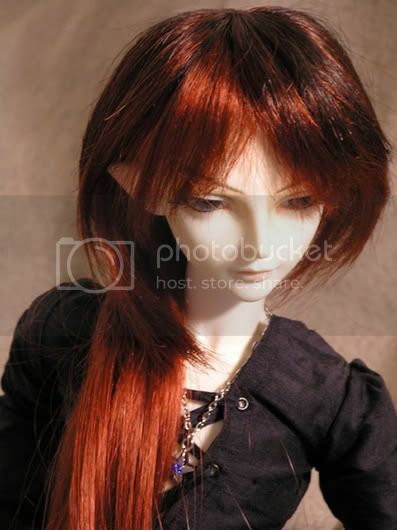 Elurin in Dollheart's Valentine '07 outfit and Luts wig. Irime in Vitta Vera.